I for one welcome our new Underlords. At the International 2016’s All Star match—a just-for-fun contest between a random assortment of players—Valve have revealed Dota 2’s new hero. The community has been waiting for Underlord—neé Pit Lord—for years. With his addition, Dota 2 is finally feature complete: every single character from the original WarCraft III mod is finally present in Valve’s definitive version. The new hero will be released on August 23rd alongside an update to the post-game UI. Underlord is a caster with tremendous utility, able to trap enemy heroes in a pit, apply heavy damage over time, and leech off their attack power when they die. His ultimate allows him to teleport an entire team’s worth of heroes to any allied creep or structure on the map, an ability that would fit perfectly in this year’s rotation-heavy meta. 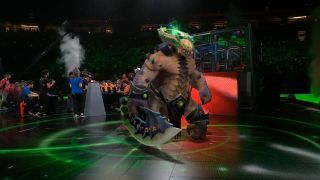 The addition of Underlord brings Dota 2’s hero pool up to 112 as the game enters an uncertain new era: will anonymous designer Icefrog create new heroes? Or is Dota 2 ‘done’? Unlike other MOBAs, heroes themselves aren’t part of Dota 2’s business model and regular additions aren’t needed to keep the game alive. Given how competitive the current pool is, with 104 characters picked or banned at the International, there’s an argument to be made that the game is perfect as it is. Check out our ongoing coverage of the International right here. It’s been a tremendous contest so far, with a healthy meta, competitive international scene, and fantastic production values. Saturday’s grand final is not to be missed.